Data analysis is steadily becoming more central to management decision-making in media organizations across the globe. The reliance of subscription video on demand (SVoD) services, such as Netflix, on data analytics to underpin deci- sions about new content investment is well-established. However, what are the key opportunities and challenges facing the rest of the television industry? This article examines how data analysis is facilitating improved methods of personalization and more effective intelligence about the relative appeal of content for differ- ing audience segments. But growing reliance on big data also raises a number of critical public interest questions. This article highlights how data is now a key source of competitive advantage in the television industry and a resource that can be monopolized. 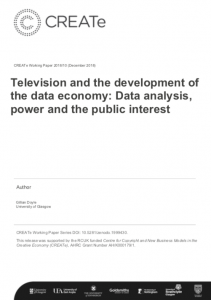 It argues that media policy-making needs to pay more attention to the emergence and implications of asymmetries of power in relation to ownership and use of data in managerial decision-making.